Brazilians will be all the rage this summer with the World Cup heading to Samba shores and it appears one of their potential stars could be Old Trafford-bound once the party’s over, if David Moyes gets his way. The besieged Manchester United boss has promised an overhaul of his under-performing playing squad when the next transfer window opens, with their chief Executive Ed Woodward confirming Moyes will be given free reign of the club piggy bank. 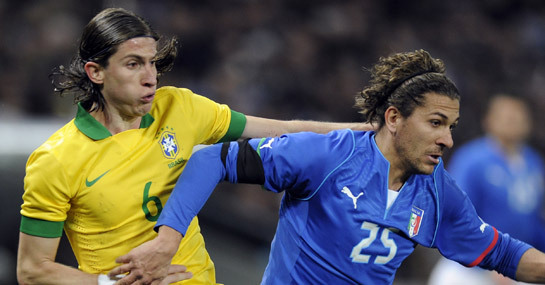 It will need a good shaking too if Moyes is to land Filipe Luis of Atletico Madrid, who is thought to be valued in the region of £20m by the Spanish outfit. But having run the rule over other possible Patrice Evra replacements Leighton Baines and Luke Shaw previously, reports suggest Moyes is intent on making 28-year-old Luis his principle target. This will be manna from heaven for United fans who’ve been privy to an absolute nosedive in fortunes in the Premier League this season. The Red Devils find themselves 11 points adrift of arch rivals Liverpool in fourth place, with long odds of 11/1 that they can reel them back in. Landing players of Luis’ calibre will certainly be required if United are going to bounce back to being title challengers next season, though failure to qualify for the Champions League this term is a worry when it comes to attracting stellar names. Luis is a strong defender who enjoys raiding down the left flank for Atletico, very much in the mould of the man he would be replacing in his pomp. As it stands, along with Nemanja Vidic, the 32-year-old Frenchman will be allowed to walk away from the club in the summer after many highly successful years at the club.